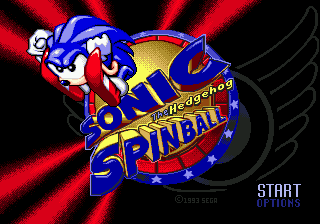 The Sonic Spinball prototype is a prototype of Sonic Spinball for the Sega Mega Drive found by Elliotro. This prototype is not much different from the final and only varies in some ways. No sparkle sound effect played during the Sega screen. A different / glitchy intro. The video also plays before the Title screen instead of after. The title screen lacks a ™ near the Sega copyright. There is no Options screen. There are some different or missing messages from the scrolling bar on the top of the screen. Debug mode is available and is activated by simply pausing the game. When debug is active you can position yourself anywhere with the directional pad. This is glitchy, however, as items may be stuck on screen after entering/exiting this mode. Different sound effects and music speeds up at some points (especially in bosses). The jingles are the same in the first version/Development of the final game. The ROM is partially overdumped. At the end of the ROM is a copy of another game, Sub-Terrania. Incomplete bonus stages. Only the Robotnik tooth bashing level is available, and it has different colors and a garbled screen behind him. Animals that appear from badniks are different. Ferrons are known as forebots. Boss graphics remain mainly intact on defeat. Hatchways rather than safety lids. Sonic is off center in the cut scene when collecting an Emerald. Using the switch that moves the bridge up will play a small Sonic 2 sound bite. In Toxic Caves, falling off into the water in the bottom pinball board yields instant death, instead of the usual splashing, then death two seconds later. In Toxic Caves, there is a layer of sludge around the bucket. Trigger on Showdown boss is more helpful. An invincible final boss. Due to this, the game cannot be beaten.